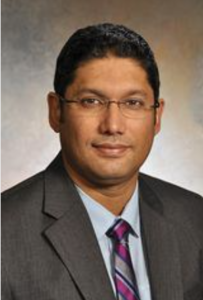 Atique Ahmed, PhD, assistant professor of Neurological Surgery and a member of the Robert H. Lurie Comprehensive Cancer Center of Northwestern University, was the senior author of the study on dopamine’s role in glioblastoma. A Northwestern Medicine study has demonstrated how the deadly brain cancer glioblastoma exploits dopamine in order to evade treatment and fuel growth, and suggests that targeting the neurotransmitter may slow cancer progression. “Our findings helps us better understand how glioblastoma cells change in order to resist current therapies and gives us ideas of how we can improve our treatments in the future,” said co-first author Jack Shireman, a member of the laboratory of principal investigator Atique Ahmed, PhD, assistant professor of Neurological Surgery. The findings were published in The Journal of Neuroscience. Glioblastoma is the most common and aggressive type of brain tumor, with a median survival of just 15 months. There is no cure, and current treatment options tend to extend patients’ lifespan only modestly. Glioblastoma cells exhibit high plasticity, which allows them to change in ways to resist treatment. This makes treatment exceptionally difficult, because the disease essentially becomes a moving target during therapy. Previous evidence has suggested that this ability is heavily influenced by the tumor surroundings, or “microenvironment” of the brain. However, how glioblastoma cells specifically interact with neurotransmitters had previously not been well understood. In the current study, the Northwestern scientists investigated how activation of dopamine receptors — a key neurotransmitter that can signal cells to change their behavior — plays a role in glioblastoma growth. The team demonstrated that dopamine signaling drives specific changes in glioblastoma cells, shifting them to become both more aggressive and resistant to therapy. Remarkably, the cells also acquire the ability to produce their own dopamine. “This represents cancer cells hijacking a normal brain function in order to help themselves,” Shireman said. The findings not only provide a deeper understanding of how glioblastoma harnesses the brain’s natural environment in order to fuel growth, but could also inform future treatment approaches. For example, there are existing FDA-approved drugs designed to reduce dopamine signaling that could be repurposed for use in glioblastoma. The authors caution, however, that much more research is needed before such an approach is ready for patients. In ongoing research, Ahmed’s laboratory is now seeking to identify specific mechanisms underlying dopamine’s role in glioblastoma. “These cells have a remarkable ability to detect changes in their environment and adapt to them. Our lab strives to better understand this, so we can develop more effective therapies,” said Ahmed, a member of the Robert H. Lurie Comprehensive Cancer Center of Northwestern University. Seamus Caragher, research technologist, was a co-first author of study. Other Northwestern co-authors include Maciej “Matt” Lesniak, MD, the Michael J. Marchese Professor and chair of Neurological Surgery; C. David James, PhD, the Jean Malnati Miller Professor of Brain Tumor Research and vice chair for research in the Department of Neurological Surgery; Herbert Meltzer, MD, professor of Psychiatry and Behavioral Sciences, Pharmacology and Physiology; Mei Huang, PhD, research assistant professor of Psychiatry and Behavioral Sciences; Shivani Baisiwala, a medical student; Louisa Warnke; Miranda Saathoff; Jason Miska, PhD; Cheol Hong Park; and Ting Xiao. The study was supported by the National Institute of Neurological Disorders and Stroke grant 1R01NS096376, the American Cancer Society grant RSG-16-034-01-DDC and National Cancer Institute grant R35CA197725 and P50CA221747 SPORE for Translational Approaches to Brain Cancer.